A Sunday morning heritage walk down Avenue Road organised by INTACH made me feel lost amidst a sea of humans, canines, bovines, motors, vegetables, fruits, baskets, text books, magazines, clothes and what not. Phew! It was quite an experience dodging past obstacles and sometimes failing to on what I would say is the most crowded road I have ever walked through in my life. In spite of being a Bangalorean, I have never been to this part of the city. And I am sure, every first timer on this road will go through the same gamut of feelings (a strange mixture of fear and excitement) that I went through. And at certain places you have to mind your head too. There were lots of things swinging in the air – cycles, stoves, brooms, plastic ware, bananas. An occasional caressing from sarees, dupattas, stoles, lungis in front of the cloth stores was soothing and had a momentary therapeutic effect. And there was someone tapping me on my back every now and then nudging me to buy lemons, guavas or peanuts. In response, I kept shaking my head hurriedly as if to say “no” lest I lose track of the walking leads and fellow walkers. 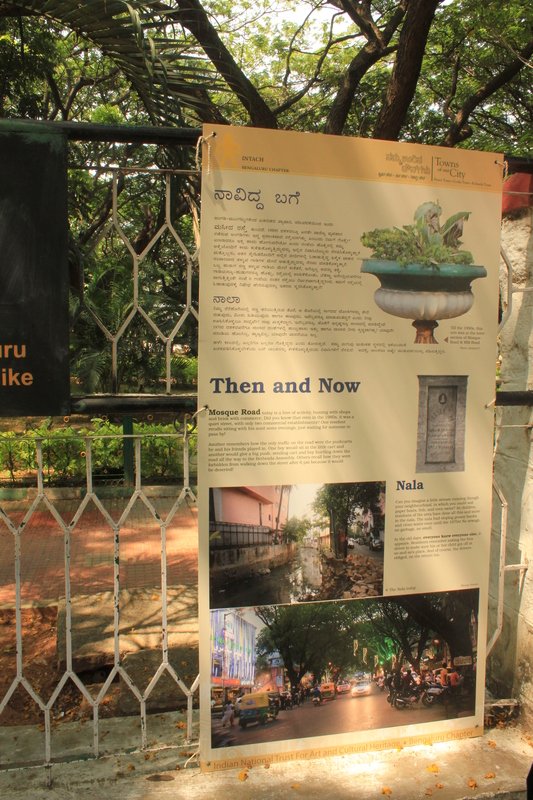 Architect Vijay Narnapatti took us walkers to every nook and cranny of Avenue Road to share various facets of the architecture here, some of them remnants from the British Raaj. On many parts of the road, the existence of old buildings alongside contemporary ones drew maximum interest. A lot of commercial complexes here are a fusion of the old and new styles where part of the building is more than 100 years old and the extended building a more recent construction. The erstwhile Mysore Bank (now SBI) building. The new Mysore Bank (now SBI) building. The two buildings, a study in contrast. The walk started around 10 am at the courtyard of the erstwhile Mysore Bank building (now called the SBI building after the merger of all sister banks with the SBI). The picture of the colonial Mysore Bank building with its contemporary version made for a study in contrast. The temple at Yelahanka Gate Police station. Most of the buildings that were built during the colonial era on Avenue Road do not exist anymore or have been given a makeover and/or extension. Maintenance of the remaining heritage buildings here leave much to be desired. A stone’s throw away from the Mysore Bank building is the temple at Yelahanka Gate Police station estimated to be about 500 years old. What we see today is not the original structure. Only the sanctum sanctorum or ‘garba griha’ is original and is home to the presiding deity of the temple who is also the guardian deity of the Yelahanka Gate of the ‘pete’ or fort area. Those days it was a practice to have a shrine near the gate of the fort and the deity who was worshipped here was largely believed to be the supreme protector of the people who lived within the precincts of the fort. 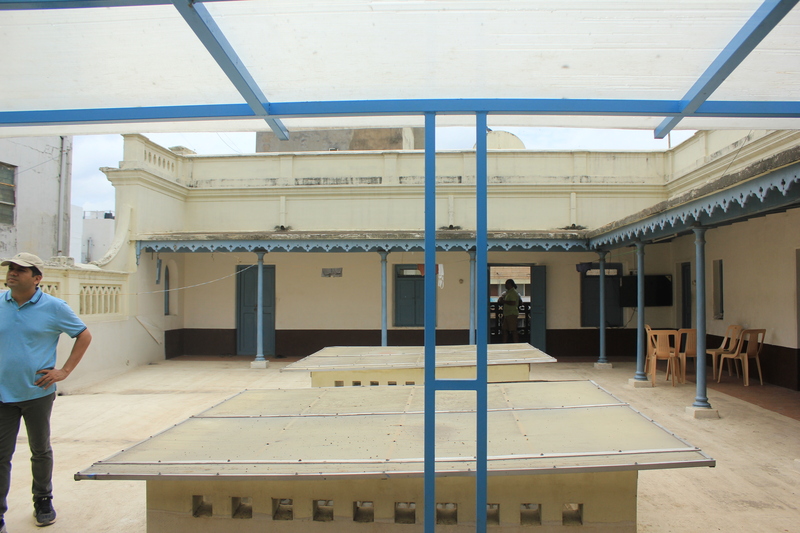 A visit to the red colonial building of the Centralised Admission Cell turned out to be a painful reminder of the lost glory of what was once a beautiful building. Unlike the exterior of the building which was fairly neat and well maintained, the interiors were dark, dingy and crying for attention. There was a spooky feel as we ascended and descended the stairs. A toy teddy hanging high on top of a rain tree added to the spooky element prevailing at that moment. The atmosphere soon took a humorous turn when someone among the walkers asked the walk lead why most colonial buildings were painted red. Pat came a reply from someone, “To conceal the paan stains”. Guffaws followed. Well, the actual reason was that red paints were a global rage during those times. Another prominent characteristic of those times were high roofs. After a few trips in and around some of the buildings we landed at the age-old Rice Memorial Church. The church was originally built in mud in 1834 but was later razed twice and re-built, once in 1849 because the building was small and next in 1917 because the building was no longer found safe and a threat to the lives of people. 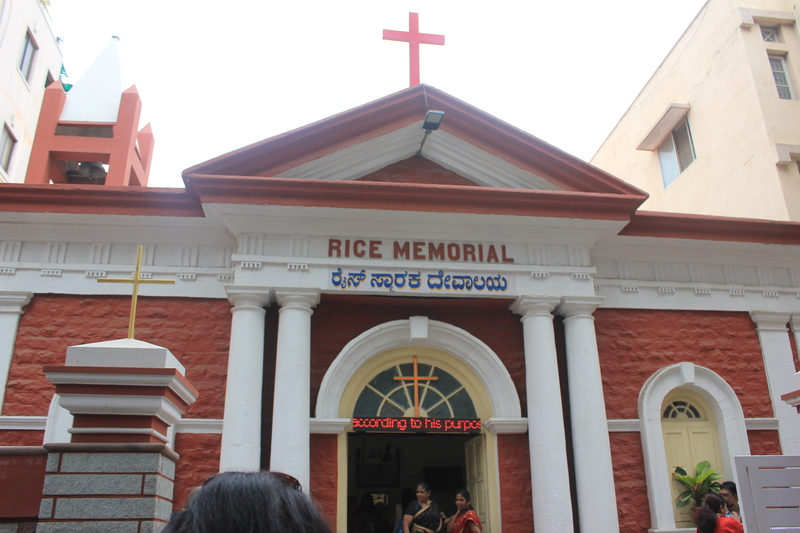 The church is named after Reverend Benjamin Holt Rice, the longest serving Pastor of the church. Rev Rice served the church from 1837 till 1887. Our visit to this church was special this being the centenary year. The interiors of the church are lit by a series of spectacular chandeliers accentuating the neatly arranged wooden furniture and large colonial style windows. The red edifice is a picture of elegance and stands out amidst all the hullabaloo on Avenue Road. 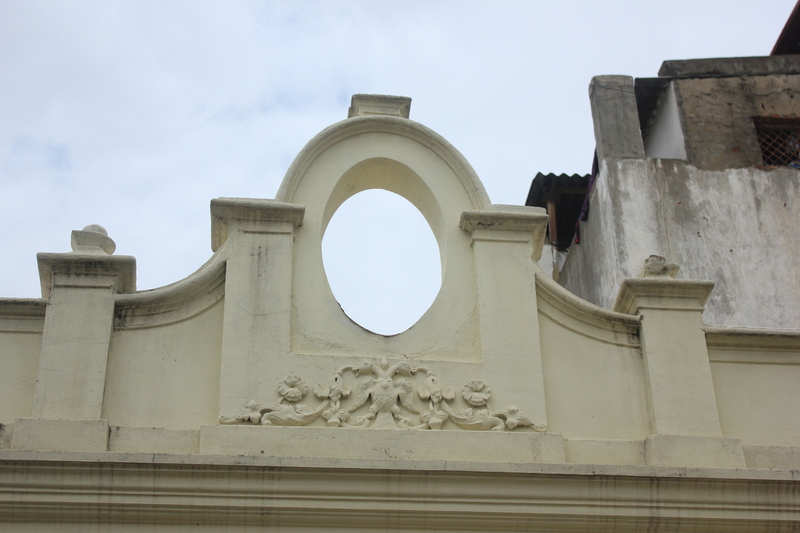 The emblem of the Mysore royal kingdom, the Gandaberanda carved on a parapet of the building. Like the Rice Memorial Church, the Chinthalapalli Venkatamuniah Setty’s Free Boarding Hostel and Choultry, is another example of good maintenance. 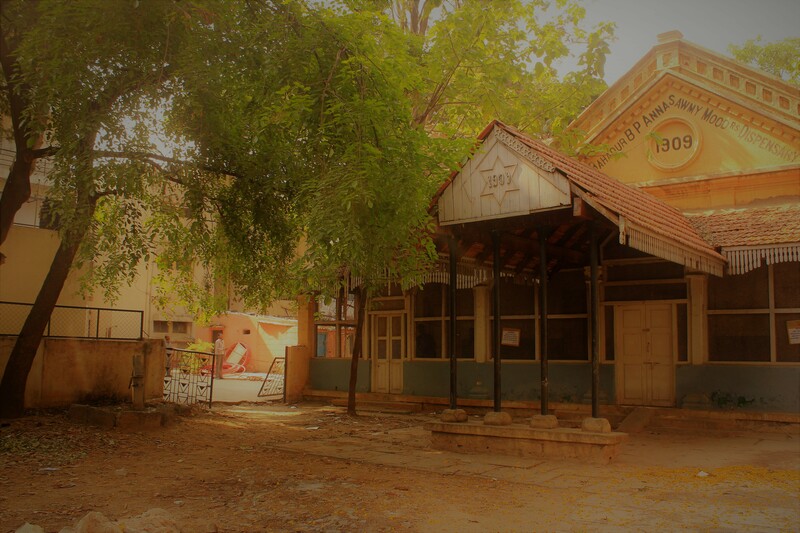 Set up in 3 December 1911, the building belongs to the family of mill owners who also own the Karur Vysya Bank. Currently, it is a hostel for students of the Arya Vysya community. The walls of the multi-storeyed building are adorned with family photos and here and there you can find antiques that could have possibly been in the building from the early 20th century. On a decorative parapet of the terrace is carved the Ganda Beranda, the emblem of the Mysore royal dynasty. The interiors are extremely well-maintained and the construction style the colonial kind. Murals on one of the walls of a room at Mohan Building perhaps created by the theatre group. 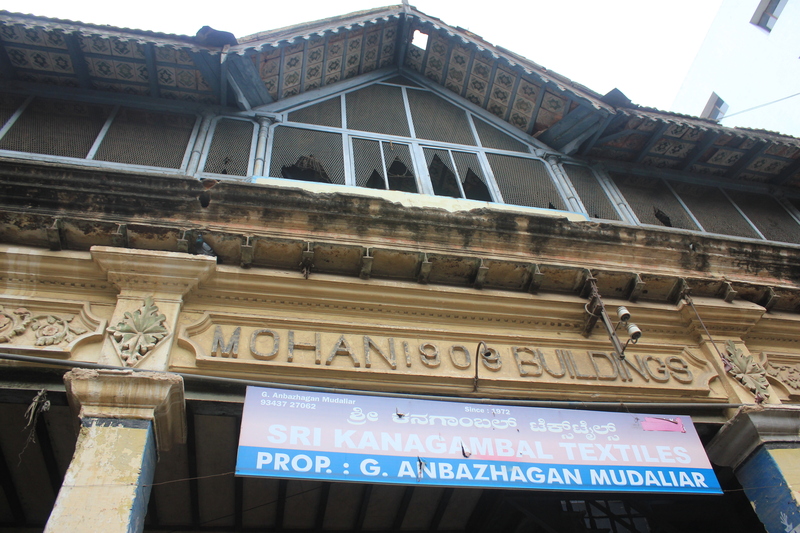 The Mohan Building which has stood tall since 1909 and today sadly lies in shambles was our next stop. Currently unoccupied, the building was once a flourishing lodge. A key box, notice boards and room numbers stand as reminders to those good old days. A theatre group performed at the building just a few days back to draw awareness to the building’s heritage value. Sadly, the building whose architecture is a mixture of various styles has been bought by a construction group and may in all probability be razed to make way for a contemporary structure. The many ‘petes’ around Avenue Road bear the names of businesses that have been thriving there. Balepet is famous for its bangle shops (‘bale’ translates to bangles in Kannada); Akkipet is known for its rice shops (‘akki’ translates to rice); likewise Kurubapet is known for its sheep business; Nagarthpet for its jewellery business; Tigalurupet for its gardeners; Upparpet for its salt business; Kumbarpet for its potters; and Cottonpet for its cotton business and so on. After a stroll through Raja Market, the walk ended with a trip to the 400-year-old dargah of Hazrat Manik Mastaan Baba who was a labourer who turned into a spiritual leader. A heritage walk down Fraser Town on a warm summer morning made my day. The walk organised by INTACH started at the intersection of Mosque Road and Coles Road close to 8am. I was one of the first to reach. 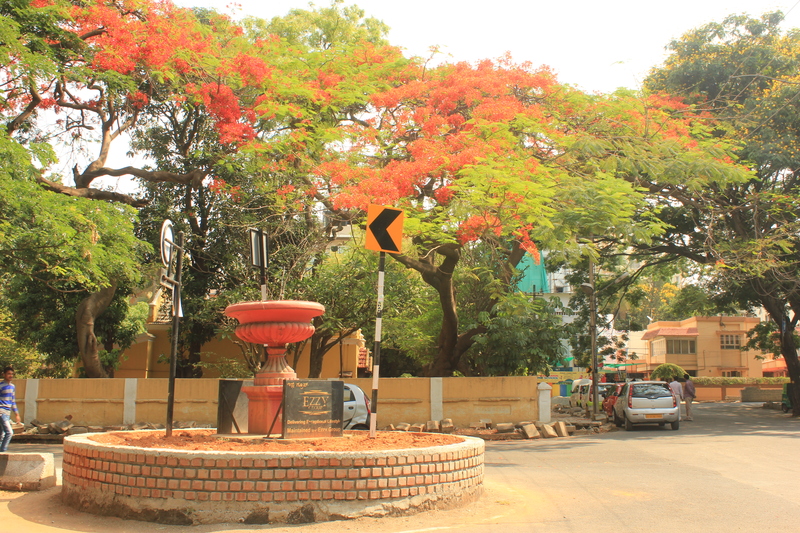 The otherwise busy junction wore a nice and quiet look reminiscent of old Bangalore. While hardly any vehicles could be spotted on the road, quite a few people had gathered at a road-side tea stall. Among the lot, two ladies with knapsacks on their backs and cameras strung around their necks stood out. I guessed they had come for the walk and walked towards them. When I reached them the three of us as if in synchronised fashion asked each other, “Have you come for the walk?”. And in an equally synchronised fashion we said, “Yeah”. “Why don’t you also get yourself a cup of tea?” said one of them and continued, “We are early and have lot of time on hand”. I looked at my watch and shook my head to agree. I normally desist having tea at roadside stalls for obvious reasons. But this time I was tempted to indulge in a cuppa. I just had to pay 7 bucks. Wow! It didn’t taste bad and I must say it removed all traces of sleep from within me. In another 10 minutes, the other walkers gradually started coming in. Among them was Priti, one of my heritage walk friends. It felt nice to see a familiar face. The walk lead Meera also joined in; again hers was another familiar face. To start with, we were shown the plaque commemorating Fraser Town. Like on my last walk (a photography walk more than two years back), the plaque is sadly a picture of neglect and hardly noticeable. The idea of developing Fraser Town and other small towns around the area was conceived after the plague that swept Bangalore in 1898. 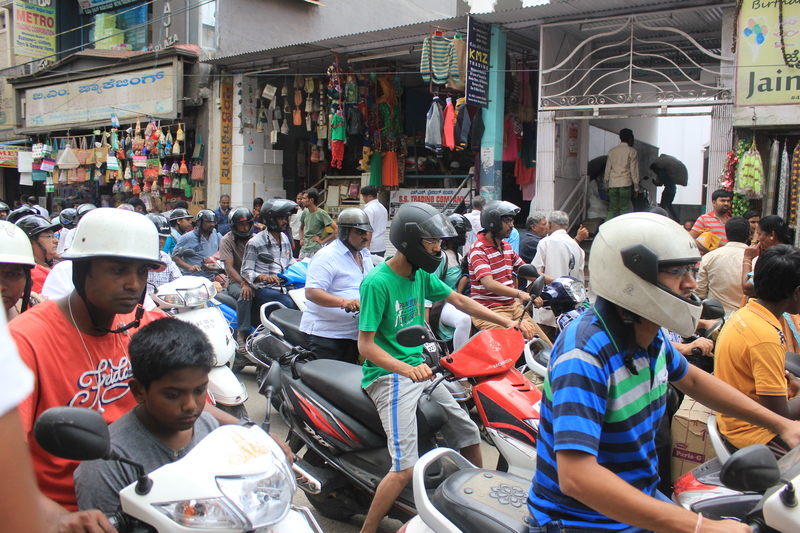 Some congested parts of Bangalore like Shivajinagar had to be decongested and townships had to be developed in other parts of Bangalore to prevent this problem in the future. 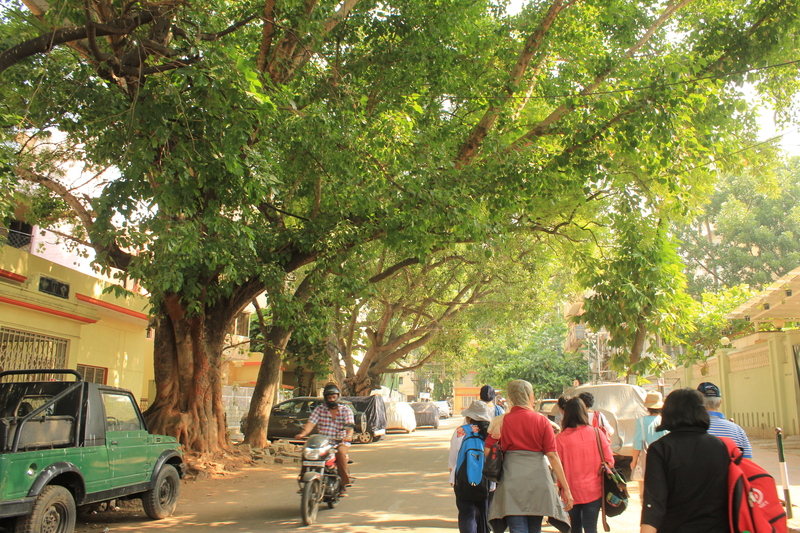 According to long-time residents of Fraser Town, Mosque Road which is easily one of the busiest roads in this part of Bangalore was very silent in the 1970s and looked picture perfect with colonial bungalows skirting it on both sides. A 1907 picture of a layout in Fraser Town consisting of 66 feet by 33 feet plots complete with conservancy lanes is in stark contrast to what the place has become today. Like in most parts of the city, most of the greenery here seems to have vanished. When we stopped by to admire a 1920s house, a man possibly the current owner drove his scooter out of the courtyard even as he announced, “No photos please”. Poor man! Real estate sharks may be time and again driving him up the wall! The Not For Sale sign on the gate says it all. Luckily, I had already taken a picture of the beauty (although not a good one) before he came into the picture. We passed another vintage house, this one built in 1939. There were a lot of sacks and bricks around. Wonder what they were doing there? And then there were two more. The last one had the “Not For Sale” sign accompanied by another with “Do Not Disturb”. A community cowshed in the vicinity, our next destination, was the surprise package of the walk. Built in 1915, the cowshed has a capacity to hold 144 cows. Currently, there are 150 bovines belonging to 30 milkmen. The milk is distributed to dairy farms, houses and there are some customers who pick up the milk at the shed. Most of the milkmen belong to a generation of milkmen whose fathers and grandfathers too rented the shed. The idea of having such a cowshed was to make availability of milk easier for people in the locality. Sadly, the BBMP is planning to demolish the shed and use the land for commercial purposes. If it goes ahead with the plan, the livelihood of the milkmen is going to be affected. They pay a rent of INR 15 for the sheds which is considerably cheap. During the early 1900s the rent was only Rs 5. And it also means one more heritage structure gone. Our next halt was at the Moore Road meat market which was a primary source of meat for the residents during the colonial era. As we walked we came across what was once a “nalla” or storm water drain built by the British and what has now become a sewage. 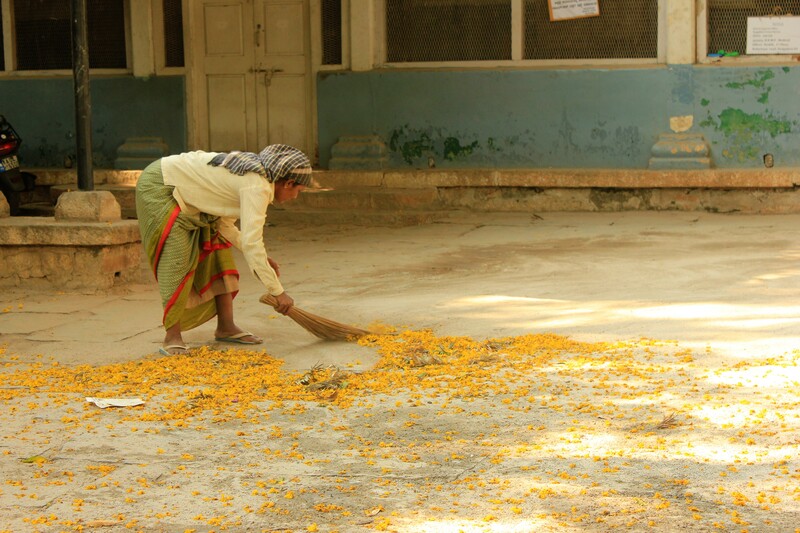 During the times of the Raaj, the nalla was so clean that locals would launch paper boats in the waters. Some of them would indulge in rounds of fishing too. These pastimes are unthinkable now. Some of the locals recollect that not so long ago the residents did not feel the need for a sump because there was enough pressure for the water to go up. 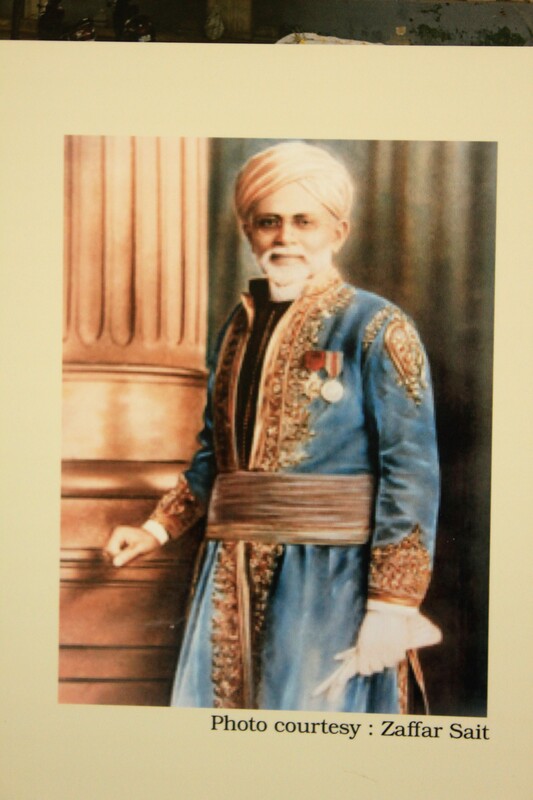 Annasamy Mudaliar who was a famous local in this part of Bangalore was a grain merchant, contractor and philanthropist who donated hugely for public causes. Among other things, he is credited with building a dispensary, a market and school. Three roads in this area are named after his three sons – Madhavaraya, Chelluvaraya and Achyutaraya. We were next taken on a recce of Annasamy Mudaliar School. With a sprawling playground part of which was a farm till the 1980s and a snow white colonial style building, the school is a perfect copy book academic institution just what children need. Plus there are so many trees all around and Indie dogs all of them well looked after. It was heartening to note that each of the dogs also has a name. Annasamy Mudaliar started the school way back in 1907 for underprivileged children most of them children of night soil workers who could not afford schooling. The medium of instruction at the school is Tamil but from June, if things go well, the school will also be imparting education in English. It felt nice to be visiting this unique educational institution. 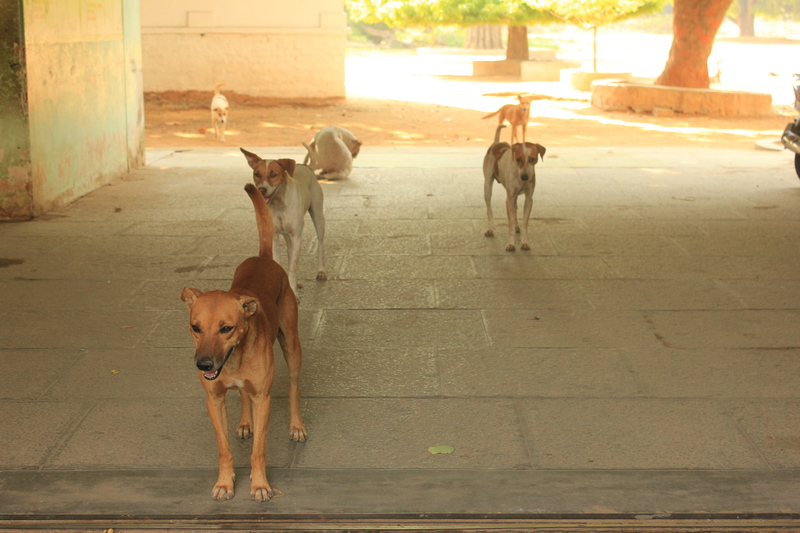 When we left the campus some of the dogs too came to give us a send-off. Aww! I’m sure they were missing all the children as the summer vacations were on. Our next halt was at the dispensary built by Annasamy Mudaliar in 1907. It seemed to be undergoing some sort of renovation. Like Annasamy Mudaliar, another prominent resident of this area Haji Sir Ismail Sait donated immensely for various causes. 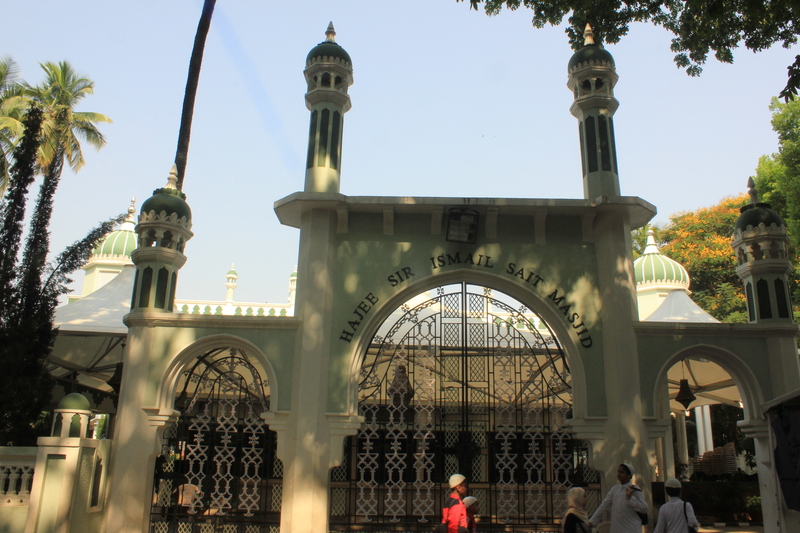 The mosque named after him stands tall on the road which has taken the name Mosque Road after this very mosque. 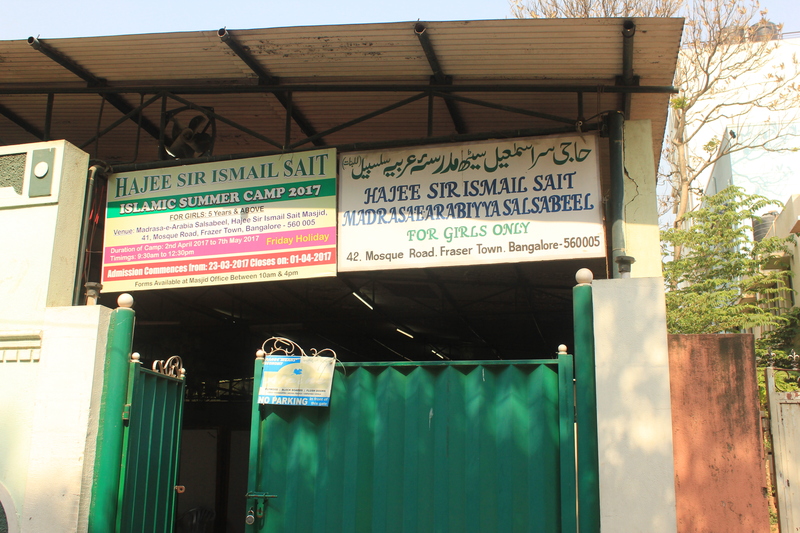 Sir Sait also started a girls-only school in the area to encourage Muslim girls to pursue academics. People from different religions and communities co-existed peacefully in Fraser Town and amidst great camaraderie. We next took the footbridge near the railway track to reach Richards Park to visit Bungalow 7, our next stopover. The beautiful edifice which has been residence to many families in the past is now a performing space. The charming interiors, the sprawling garden, and outhouses serve as indicators to what life was in the early 1900s. The walk ended at Richards Park which was the venue of an INTACH exhibition on yester years’ Fraser Town, Cooke Town and Richards Town. To mark the month of Mahatma Gandhi’s birth, the National Gallery of Modern Art in Bangalore put on display a collection of rare photos of the Father of the Nation. The sepia-toned gems are the works of Mahatma Gandhi’s personal photographer and grand nephew Kanu Gandhi. Gandhi on the phone at the Sevagram Ashram (1938). Photo courtesy: NGMA. Kanu Gandhi (1917-1986) spent a major part of his childhood at the Sabarmati Ashram. His parents Narandas Gandhi and Jamuna Gandhi worked in the Ashram. Narandas was Gandhiji’s nephew. Later, as per his father’s wishes, Kanu took up residence at the Sevagram Ashram where he served the Mahatma. His daily grind included handling Gandhiji’s correspondence, clerical and accounting work. His devotion to the Father of the Nation earned him the sobriquet “Bapu’s Hanuman”. In 1944, Kanu Gandhi married fellow Ashram worker Abhaben Chatterjee with the blessings of Mahatma and Kasturba Gandhi. A keen interest in photography followed and Kanu was encouraged by Shivaji Bhave (brother of Bhoodan Movement leader Vinobha Bhave) to pursue his passion by clicking the happenings at the Ashram. Although Gandhiji was initially not in favour of the idea he later relented and asked noted industrialist Ghanshyam Das Birla to fund Kanu’s new passion. The businessman gifted him Rs. 100, a princely sum those days, which was enough for Kanu to buy himself a Rolliflex camera and a film roll. – The ashram will not help him with any funds. As Kanu was among the privileged few who were allowed close access to the Mahatma, his photographs began to gain in popularity. Amritlal Gandhi of Vandemataram magazine began offering him a stipend of Rs. 100 every month. The photographs soon started making their way to various dailies. A lot many of them did not see the light of the day because Gandhi refused permission including one where Kasturba lay dying on his lap. When Gandhiji was assassinated in Delhi in 1948, Kanu was not at his side. He was in Naokhali in East Bengal working on one of the leader’s assignments. Gandhi breathed his last on Abha’s arms. After Gandhi’s death, Kanu lost interest in photography. Instead, he and Abha preferred travelling and spreading Gandhi’s philosophy and ideals most importantly the idea of using Khadi or homespun cotton. Kanu Gandhi died of a heart attack in 1986 when on a pilgrimage to Madhya Pradesh. 1) Distant shot of Jawaharlal Nehru and others at Sevagram Ashram in 1946. 2) A 1937 picture of Gandhi’s hut. 3) Kasturba massaging Gandhi’s feet (1939). 4) Gandhi in his hut. 5) Mahatama’s rickety van being pushed by Pathans and Congress workers (1938). 7) A 1938 picture of Jawaharlal Nehru at Sevagram Ashram. 8) A photo with Netaji in Birla House (1938). 9) Kasturba washing his feet (1939). 10) A picture of Gandhi with Rabindranath Tagore (1939). 11) A 1939 picture of him fasting with this sisters massaging his feet. 12) Picture of a 1941 visit to Jabalpur. 13) A picture of him and Kasturba Gandhi at Aga Khan Palace in Poona, 1944. 14) A picture of his blood stained cloth after being assassinated, 1948. 15) Gandhi on a visit to riot-affected Noakhali, East Bengal, 1946. 17) Jawaharlal Nehru pondering at Khadi Prathistham. 18) There are quite a few photos of Gandhi on the train journey from November 1945 to January 1946 to collect donations for the Harijan Fund. 19) Picture of Gandhi sleeping in the train. 20) A striking picture of crowds waiting to meet Gandhi. 21) Gandhi standing on a weighing scale. The entire collection can be viewed in the coffee table book “Kanu’s Gandhi”, available online on Amazon.com. The Nazar Foundation has played a significant part in unravelling the treasure trove of photos. Had it not been for the foundation, the photos would have faded into obscurity. According to Prashant Panjiar of the Nazar Foundation and co-curator of the exhibition along with Sanjev Saith, Kanu never had copyright over any of his photos. There is a possibility that the picture of Gandhi on Indian currency notes could have been a photo taken by Kanu. The exhibition is on till the 30th of October. In response to this week’s photo challenge, I am posting pictures of Lal Bagh and Cubbon Park, two popular green spaces in Bangalore, the city I live in. On top of Lal Bagh rock with Kempegowda Tower in the background. Walkway beside Lal Bagh lake. Sunset at Lal Bagh as seen from behind Kempegowda Tower. 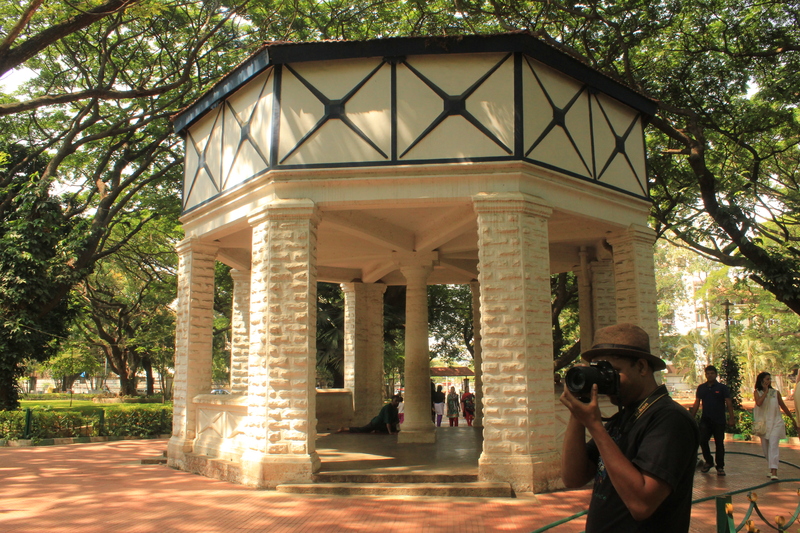 The bandstand at Cubbon Park with the Tree of Gold in full bloom in the foreground. The Cubbon Park entrance of the High Court of Karnataka. The library at Cubbon Park.